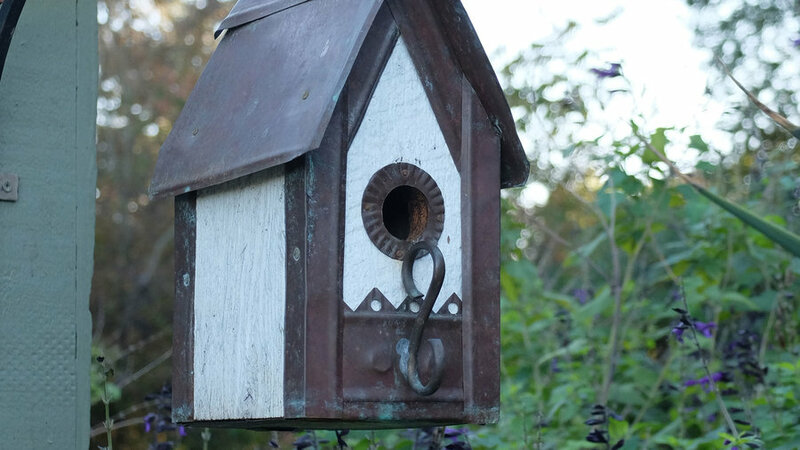 There are two kinds of birdhouses: ones that add beauty or playfulness to a garden, and ones that birds actually nest in. 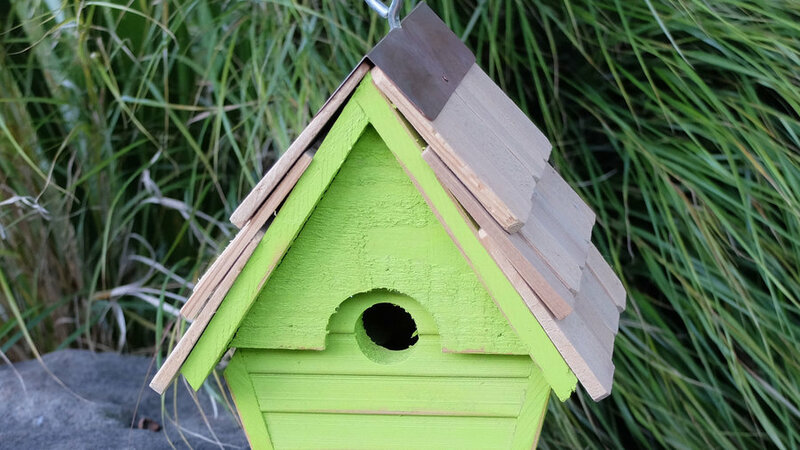 For serious birders, choose houses in materials that insulate well, like wood that’s at least ¾-inch thick, with entry holes the right size for the birds you want to attract, and access to the inside for cleaning. 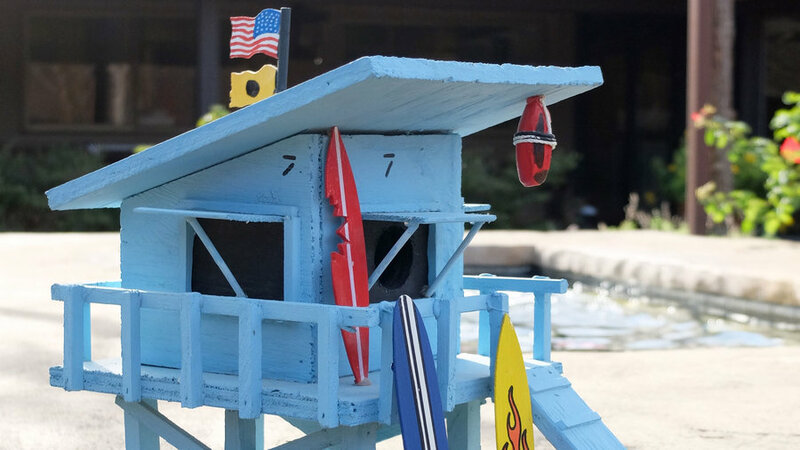 For fun, choose the style that you love, like this “Baywatch Birds” lifeguard house from Malibu. Then hope that the right bird finds it. 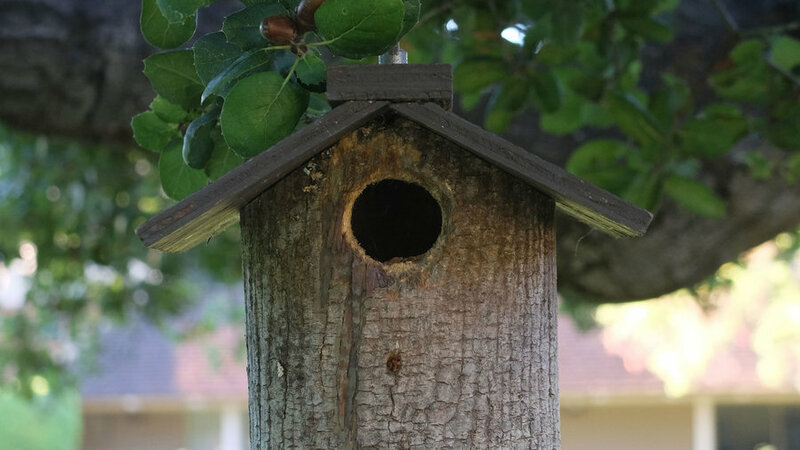 Made of made of redwood or cedar, most bluebirds houses are about 8 inches deep and 5 inches square, with a 1 ½-inch diameter entry hole located about 6 inches above the floor, and a top or side entry to facilitate cleaning. 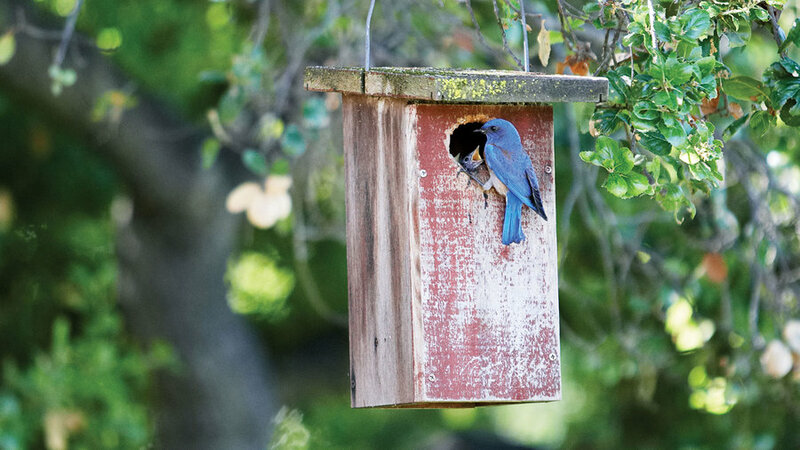 This one, under an old oak tree in Sunset’s original Menlo Park, California, garden has hosted bluebirds for years. 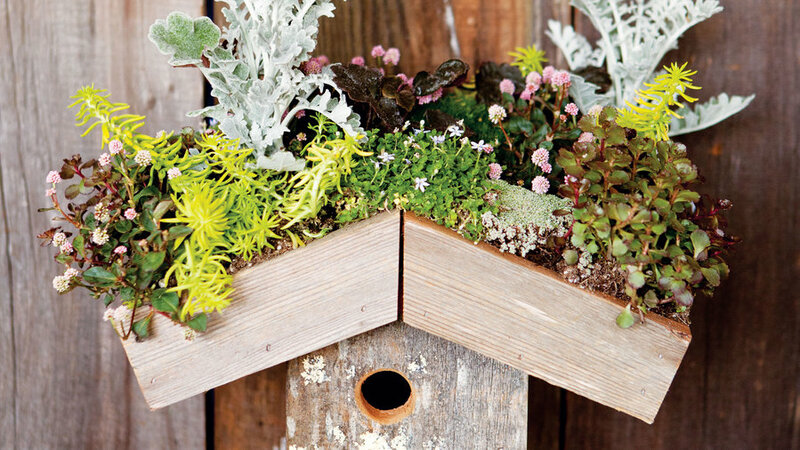 The vibrant finishing touch for eco-minded birds, this thick-sided roof shows off small sedums, knotweed, and dusty miller. Design: DIG Gardens, Santa Cruz. 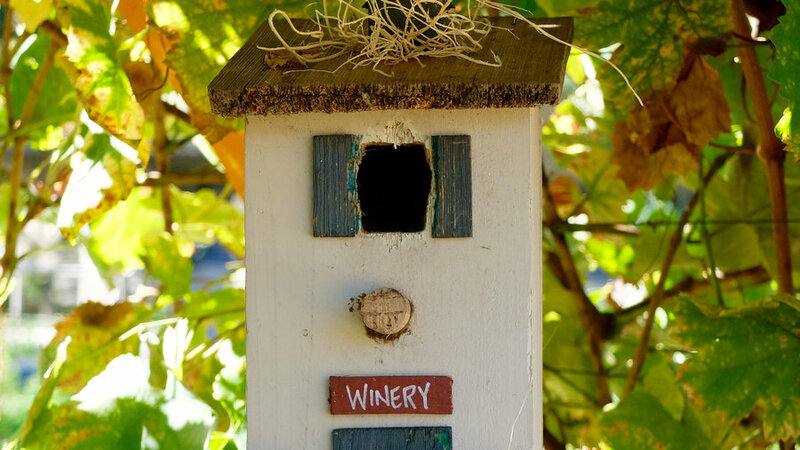 This winery-style birdhouse with a decorative cork perch came with tendrils of Spanish moss wrapped around its chimney. The first year, house finches pulled off the moss to line their nest inside. A “Merlot” barrel ages in front; a shingle forms the roof. Our “winery” hangs from a trellis clad in grapevines. 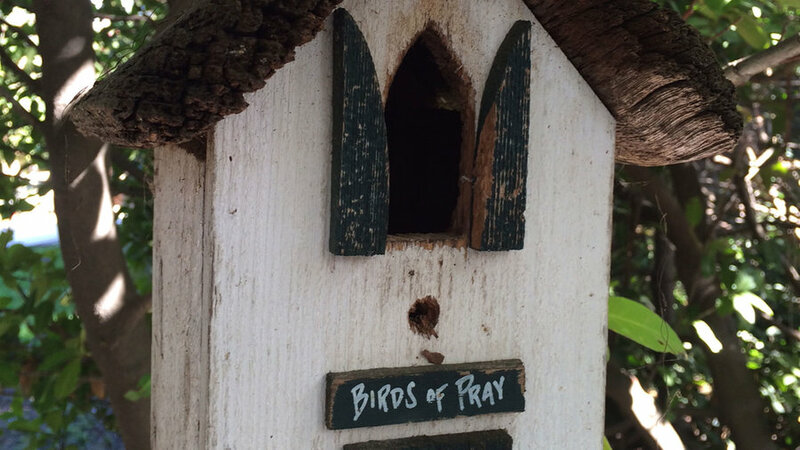 We found this little house at in Monterey’s Del Monte Shopping Center; it’s just the right nesting spot for small birds such as sparrows. As colorful as the cottages lining Capitola Beach, it has a folded copper strip capping its shingled roof, and a 3-inch-square patch of copper sheeting—easy to remove—that conceals the access hole in back for clean-outs. Made by a passionate Northwest birdwatcher from a hollowed piece of log, this natural-looking birdhouse hangs about 7 feet above the ground in an oak tree canopy, where it’s protected from marauders. The house is 8 inches deep and 4 inches wide, with a 1 1/8–inch-diameter entry hole located about 6 inches above the floor, and a bottom that‘s removable for cleaning. 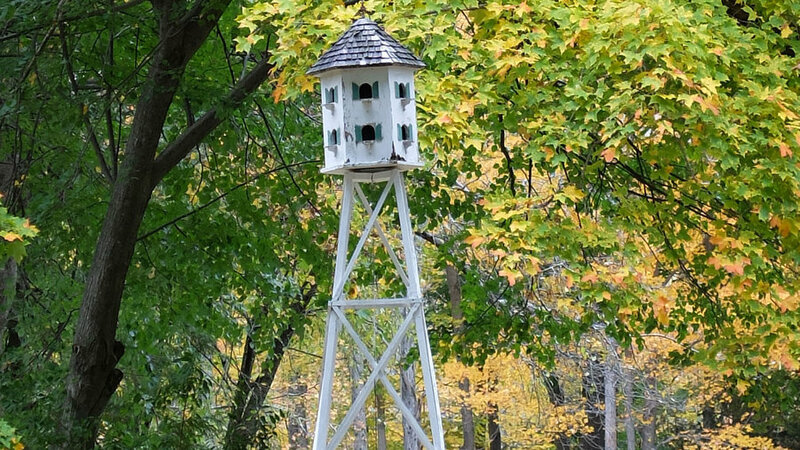 Its entry hole is larger than necessary (in keeping with the theme) but this avian sanctuary—with two shingles making up the roof—is so hidden in a tree canopy that nesting birds enjoy protection here every spring. We removed the perch it came with came with—it’s unnecessary, and bigger birds could use it to heckle smaller ones inside inside. This vintage beauty of rough-hewn wood has copper trim and roof. Both have taken on a greenish-brown patina with age, as has the copper S-hook soldered on the front. Birds and birdhouse-makers, it seems, love teardrop trailers as much as road-trippers do. 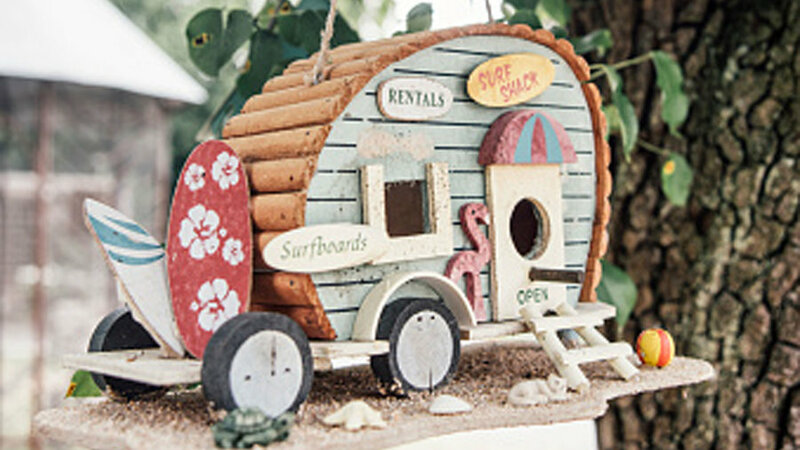 This little four-wheeler has all the amenities, from beach balls and surfboards to a kitschy pink flamingo. Purple martins are among the few birds that like to congregate with their relatives in an apartment-style dwelling. The structure should be light enough to lift and lower for cleaning, and it must provide good ventilation, with ¾-inch vent holes—and 2½-inch entry holes—for each floor. White exterior latex paint helps keep it cooler. Mount the structure atop a stout pole or post.